I arrived at the end of June in flurry of auto-rickshaws, an epic train journey and an all night Kattaikkuttu performance, just as the month of storytelling was about to begin at Kattaikkuttu Gurukulam. It began with the arrival of professional storyteller Craig Jenkins on the 5th of July on his forth pilgrimage to the school. The excitement and exhilaration of everyone at the school (not just the children) told me this was indeed a special visitor and this month would indeed be one to write about. I had to admit to Craig that I never realised Storytelling was a profession and not only that but an intricate and important art form, which like dance, acting, writing or painting must come from the heart and with a passion for the meanings and truths behind what is being told or addressed. There is a vast oral and written tradition of storytelling here in India and many Middle Eastern countries, a lot of which will now have been translated for the western world and so, will be familiar to many. For example, I’m sure most people will know of the Middle Eastern epic – One Thousand and One Nights (or Arabian Nights) famously popularised and americanised by Disney. Perhaps their knowledge of the roots of Aladin or Ali Baba The Forty Thieves is a little vague however. What Craig brings to Kattaikkuttu Gurukulam is by all means not a westernised version of the Mahabharata or the Ramayana, neither is it simply the beautiful oral tradition passed down to him through his much loved Guru Vayu Naidu; it is an exciting, enticing and educational experience through which he applies his successful mantra of taking old, traditional stories and bringing them into the contemporary. This allows students of all ages to deconstruct the stories they have heard their whole lives, look at them from a different angle, redesign their meanings and use them to examine contemporary issues such as gender and prejudice. This is complimented by learning new stories through which students can learn for themselves how to create, construct and perform these stories. As I write this I realise how much I have already learnt about this art and I am excited to learn more. 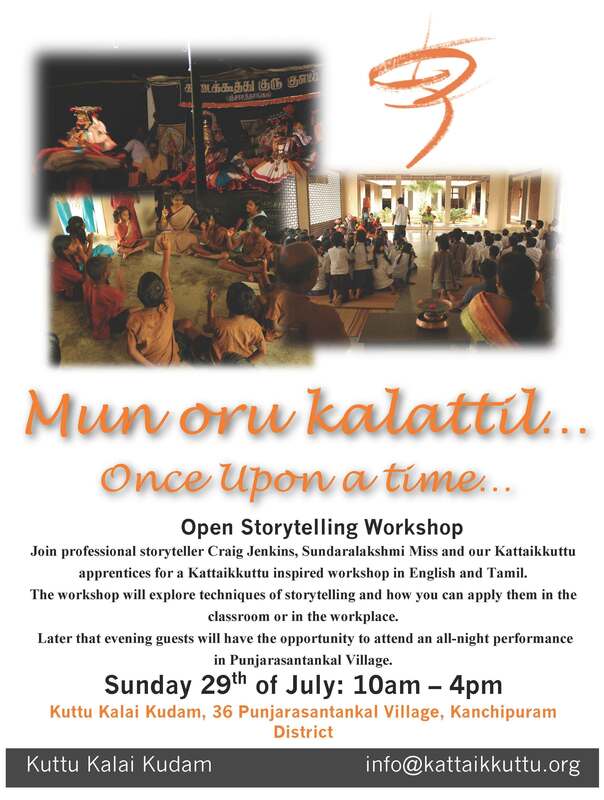 Our storytelling workshop ‘Mun Oru Kalattil,’ taking place at the end of this month will provide me with the perfect opportunity. It will be a truly educational and eye opening experience for everyone involved, whatever their profession or reason for attending. However, learning about this art has made me wonder why we have lost the presence of this tradition in our own culture. Undoubtedly it is still there but I think its importance and meaning within society has been lost, especially in an educational sense. Perhaps I am wrong however and it is simply my own ignorance to the art which has denied me to see it in its full light and capacity back in my corner of the world. And with that thought, the will in me to learn more about storytelling and the stories which have been kept alive in India through this oral and written tradition, has grown all the stronger! 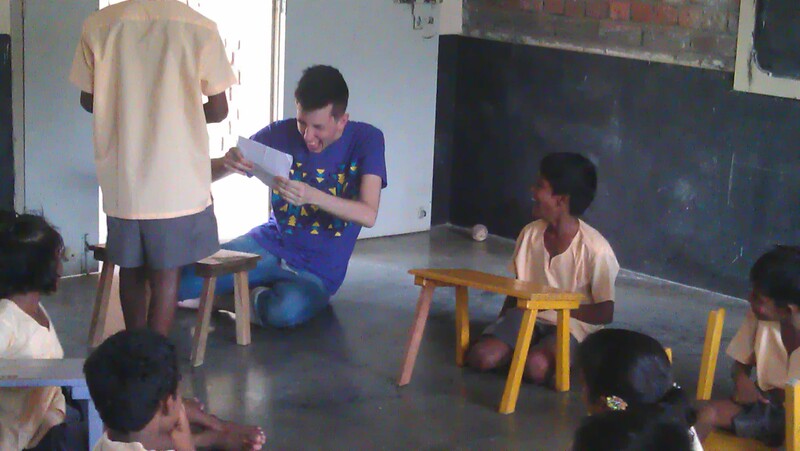 Storytelling has a long tradition in many cultures. It’s wonderful that you’re having that workshop. Can anyone participate? The art of storytelling is one that has intrigued me, and I like to use it in my practice as a speech pathologist, given my drama/theater background. But it does take a lot of planning.